Wineries offer wine lovers the delights of the cellar door… and the Sunshine Coast’s Hinterland Feijoas offer an ‘orchard door’ arrangement where locals can pick up their (pre-ordered) fresh and organic feijoas. It’s much more than that though: if you care to stop, you can relax in the shade of the verandah, overlooking all those yummy feijoa trees and the gorgeous vista of Belli Park’s horse studs and farmland, and discuss and enjoy all things feijoa. If you can get past the table of temptations, which I couldn’t – preserved feijoas, different flavoured feijoa jams, balsamic glazes and chutney made with the fruit – there is also feijoa gelato, tea and coffee, and on this auspicious occasion, a freshly baked feijoa and coconut cake**. Heaven, I was thinking the whole time, I’m in heaven. Hinterland Feijoas is owned by Peter Heineger and Sally Hookey. There’s lots more about them on their website (see link below). Sally and I have been writing and commenting and cheering on the feijoas for some time now but we had never met before. I had prickly tears when I saw her beautiful smile and there are many good reasons why these two and their endeavour won the Small Business of the Year 2012 in the Sunshine Coast Excellence in Business Awards. I just deleted a paragraph because I got too gushy… but if you can make it up that way, go check out something special. Just take a good map. In New Zealand, it seems fair to say that nearly every road leads to a feijoa tree. But in Australia, only a few do and they can pose a trick or two for the sat-nav^. * I think my son cleaned out the tasting table while we were talking – apologies to everybody else. ^ Hint: there are short-cut roads but you do not want to take them if you are not in a SUV or are constrained by time. Stay on the Eumundi-Kenilworth Road. More sources for feijoas in Australia will be featured soon. If you sell them from your farm, or know of a suburban tree where the fruit is going to waste and want to share… let me know. 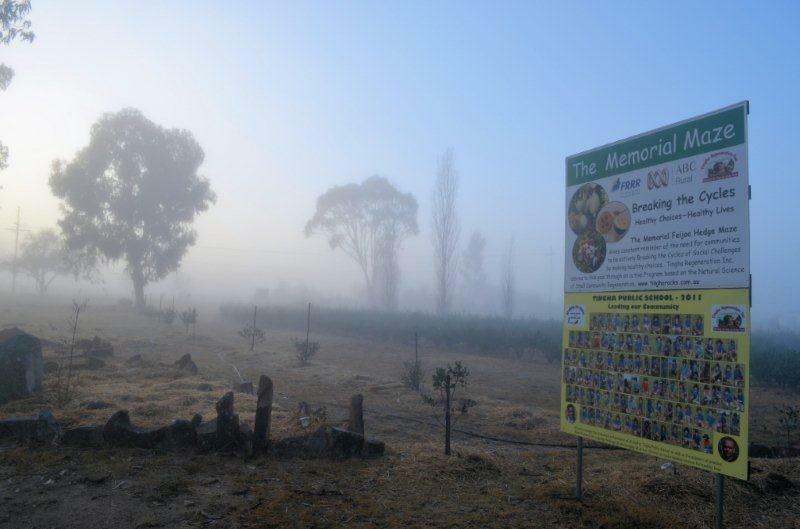 Let us know if you stumble across any more great nurseries where you can purchase quality fruit trees. As is mentioned here and there, and is oft debated, a cheaper seedling plant may be the problem if your tree is not fruiting. If you want reliable and bountiful crops of feijoa fruit then buying a grafted, named variety is recommended. If you’re buying from Bunnings, and the plant has no ‘name’– just a label that says feijoa acca sellowiana – then it’s a seedling plant and the results can be less than fruitful. You will pay more for a cultivar than a seedling, usually. In the comments below there are some great tips on growing your own trees, and it pays to remember that there are many variables in getting your tree to fruit. The selection of cultivars is not huge, but at least a few of them are supposed to be good. Also, Home Depot stores in California often sells the Nazemetz cultivar. The Chair of the Australia New Zealand Feijoa Friendship Association Philip MacIntosh recently discussed feijoas with Jennifer Stackhouse on ABC Radio’s gardening show (6 June 2011) and commented that “there are now one million and 59 different things you can do with this unusual fruit.” Download the audio file here. They have just finished a bumper season by all accounts but Sally Hookey and Peter Heineger of Hinterland Feijoas on the Sunshine Coast in Queensland have also solved the problem of getting that fabulous feijoa flavour all year round. 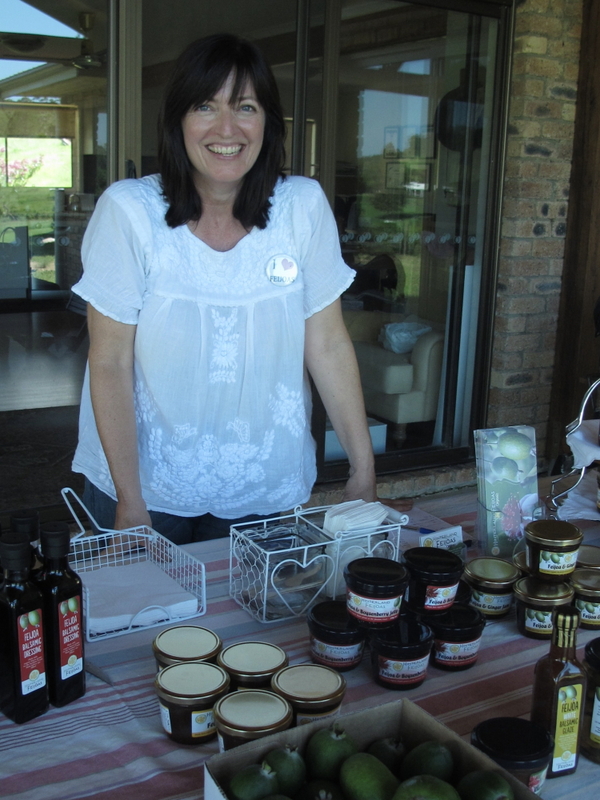 With a 700-tree orchard growing six different feijoa varieties, Sally and Peter distribute their fruit locally in autumn and have also created a range of hand-made jams and chutney for sale year round. Pulp from their feijoas also features in local smoothies and sorbets. 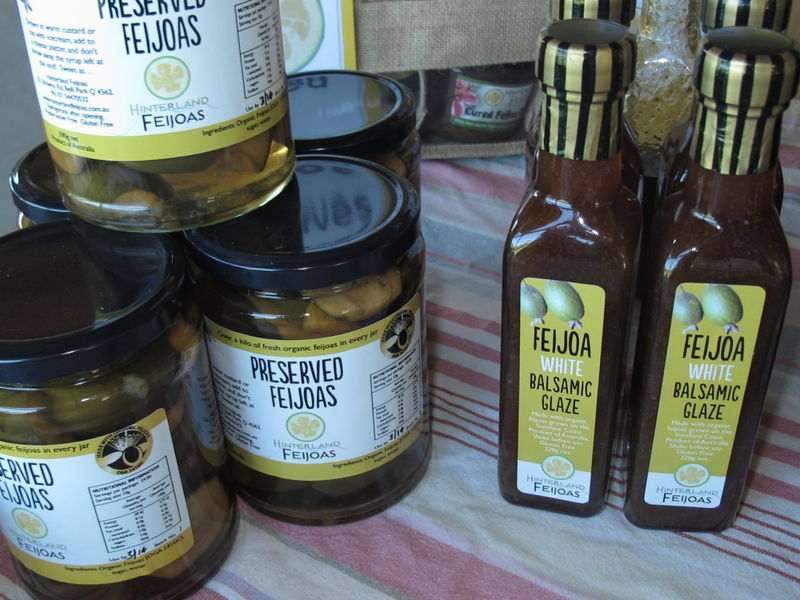 That’s the great news for Sunshine Coasters who are addicted to the feijoa taste, but the good news for the rest of us further afield is that you can also order the jams and chutney by mail if you’re hankering for quality products made from feijoa. Oh, and it’s all farmed organically, which means it doesn’t get any better. 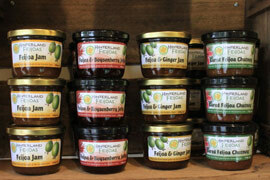 Created from recipes by local chef Peter Wolfe, the product line includes feijoa jam, feijoa and boysenberry jelly, feijoa and ginger jam, spicy cured feijoa chutney, and feijoa and rosella* jam. A quick link to their Facebook page so you can share their contagious enthusiasm for the fruit and be part of the Hinterland Feijoas community. An online shop coming soon. *And if you want to know what a rosella is (no, it’s not a bird in this case) join the Hinterland Feijoas Facebook page – Sally has much more information including photographs. Looks so delicious! A report from Radio New Zealand (11 May 2011) regarding a search for a solution to the Australian guava moth, which is now found in parts of Auckland and Northland in New Zealand. Guava moths attack a range of soft fruits, including feijoas. 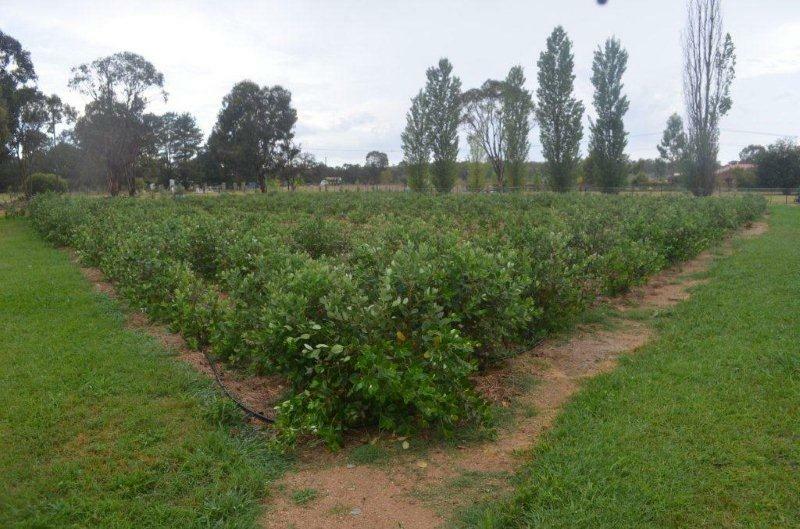 A Riverland horticultural business, GM Arnold & Son, has announced plans to create a commercial feijoa orchard, with the support of the South Australian Government. Mail order feijoas. Now how is that for a novel idea and a brilliant little niche in the exotic fruit market? Well, if you can think of it, someone’s probably doing it, right? Absolutely. I recently discovered a small company called Feijoa Direct online. Of course, I am often found keyword searching all manner of things feijoa and this website was a new addition in Google’s search results. 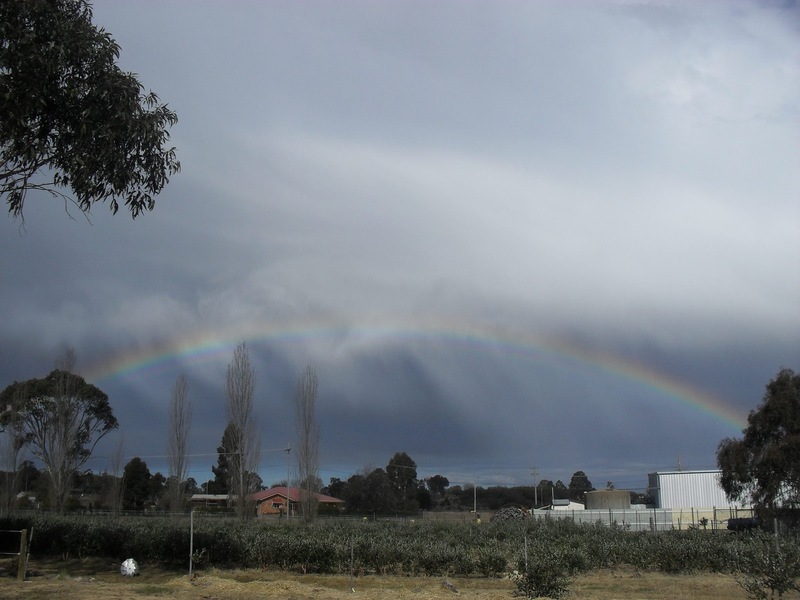 The business is based around an orchard of 400 trees in the locality of Nambugga, just out of Bega on the New South Wales south coast. This year, 2011, is their first crop. So, it’s very simple. You fill out the online order form and once you’ve handed over your money and exactly as the name suggests, they send your feijoas directly to you. Yep, to the door. I just love this idea and I’ve already put my order in*. I am awaiting with a whole lot of excitement my box of fresh feijoas. I’ll be interested in how the soft-skinned feijoa copes with the courier system and how good they taste. Owner Kevin Dibley seems pretty friendly and he says he’s been inundated with orders (mostly kiwis of course). He warns on the website that it is a small crop and supply is limited, so get thee over there and give them a bell. *I am absolutely sure I haven’t ordered enough.